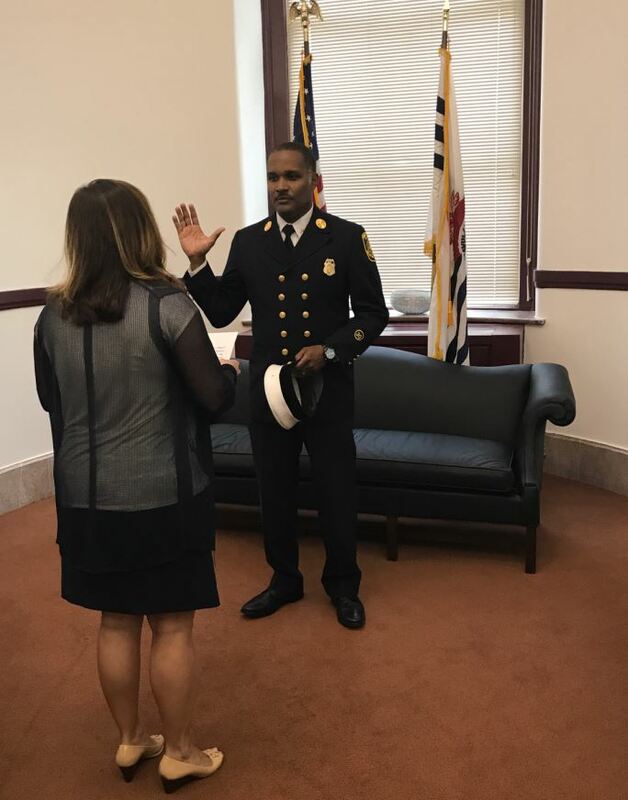 CINCINNATI – The City of Cincinnati has appointed Roy E. Winston as the permanent Fire Chief of the Cincinnati Fire Department (CFD). Chief Winston, a longtime Cincinnati firefighter and former Assistant Chief for the Department, has served as Interim Fire Chief since the retirement of Chief Richard Braun’s in April. City Solicitor Paula Boggs Muething swore-in Chief Winston Thursday during a ceremony inside the office of City Manager Harry Black. 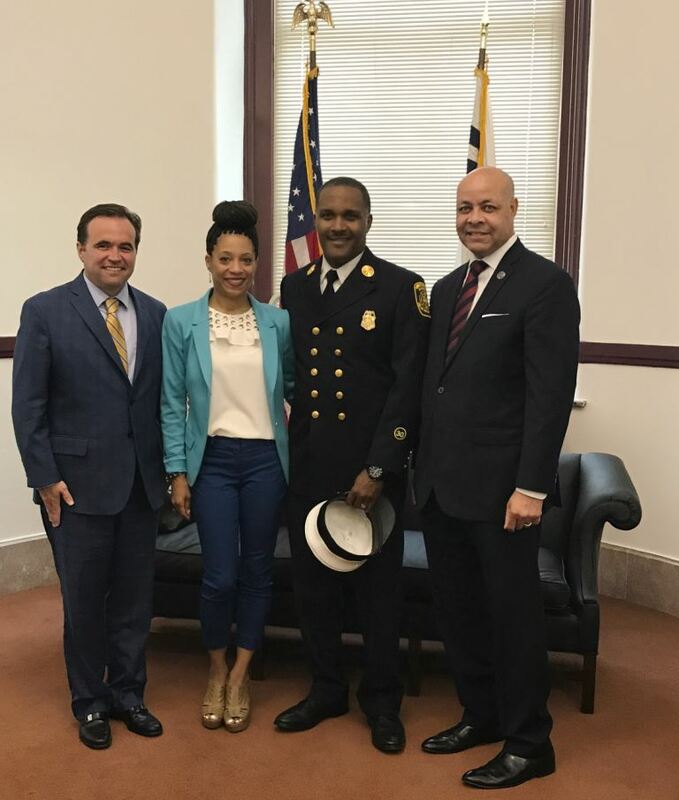 Joining them were Mayor John Cranley and Chief Winston’s wife, Ursula. Chief Winston is the 17th Fire Chief in the history of the Cincinnati Fire Department, the oldest fully paid professional fire department in the country. “Though there were many highly qualified candidates, it was clear that Chief Winston is the right choice to lead the (Cincinnati Fire Department) right now. He is highly qualified, respected by those he leads and cares deeply about preserving the safety of this city,” wrote City Manager Black in a memo to the Mayor and Council announcing the promotion. This hiring of Chief Winston comes as the result of an extensive, months-long national search which began prior to Mr. Braun’s formal retirement. Facilitated by the City’s consultant, Ralph Anderson and Associates, several meetings were held with key stakeholder groups to discuss the position profile for the City’s Fire Chief. Key stakeholder groups included the Mayor, City Manager, City Council members, the Cincinnati USA Regional Chamber, Cincinnati Fire Foundation, Cincinnati African American Firefighters Association, and a conference call with the President of the International Association of Fire Fighters. In addition, the Cincinnati African American Firefighters Association provided a formal letter to the consultant group of recommended key focus areas. Information gathered from various community and departmental surveys played a key role in the development of marketing and outreach materials used to identify top candidates for the position. More than 500 community members and nearly 200 firefighters participated in the various surveys. A selection committee of internal and external stakeholders unanimously recommended Chief Winston for the position after a series of interviews with eligible candidates. “I want to thank all of those who participated in this intentionally inclusive process including those who filled out surveys, attended meetings, and participated on the selection committee,” City Manager Black continued. Fire Chief Winston has served the Cincinnati Fire Department with distinction for nearly 30 years. Since joining the Department as an 18-year-old, Chief Winston spent the past three decades working his way up the professional ladder from the position of firefighter to the command ranks. Over the course of his exemplary career Chief Winston has held the positions of Assistant Fire Chief of Operations and Human Resources; District Fire Chief for Districts One and Four; and the Fire Communications Center. Chief Winston has achieved numerous awards and commendations during his career including being honored for leadership by the Cincinnati Rotary Club in 2006. Beyond his professional and education successes, Chief Winston has served in a variety of leadership capacities including Advisory Board positions with Scarlet Oaks Workforce and Western Hills Law & Public Safety Program. He has served as a mentor for students at both Western Hills and Princeton high schools. Chief Winston holds an associate degree in Business Administration from Kaplan University and a bachelor’s degree in Human Resources Management from Columbia Southern University.